The Belgian Army Air Corps Squadron at Manston. 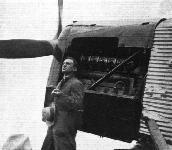 The machines are Breguet XIX's reconnaissance aircraft and an built in Belgium. The Squadron arrived on May 5 and spent the rest of the week visiting other R.A.F. stations. Grp. Capt. 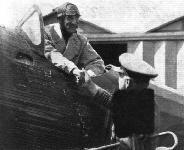 R. C. M. Pink greeting General Gillieaux on his arrival with a squadron of the Belgian Army Air Corps at Manston. 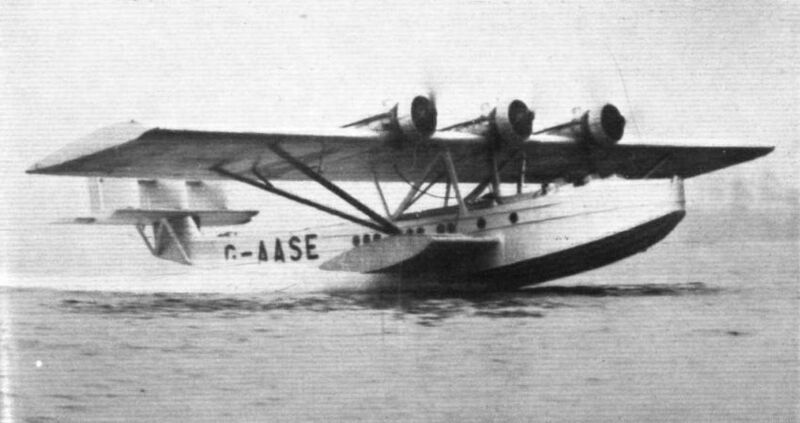 THE SERIOUS SIDE: A three-engined Junkers seaplane belonging to the Swedish Air Transport Company. 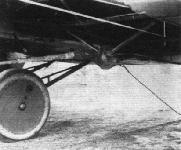 FOR THOROUGH TESTING IN THE AIR: The Junkers type F.24 into which the Junkers "Jumo 4" heavy-oil engine has been fitted. EXPLAINING HOW IT WORKS: Dr. Gasterstedt, one of the designers, explaining to visitors to Tempelhofer Feld the principles upon which the Junkers heavy-oil engine is based. A ROYAL PRIVATE OWNER: The Prince of Wales is now well known as an enthusiastic owner of aircraft. Here he is alighting, together with Prince George, on his return to Windsor from their South American tour. On this occasion he made use of an Imperial Airways Argosy, although while at Buenos Aires he made extensive flights in his own Puss-Moth. I.L.I.S. : The main exhibition building is seen on the right. On the left is the tent hangar occupied by the Finnish exhibits. NOT AN EXHIBIT: Another "Moth" seaplane whose home is at Lindarangen. SWEDISH GIPSY MOTH SEAPLANE: In the background may be seen a small portion of the Free Harbour of Stockholm, which adjoins the seaplane station. The new low drag undercarriage on the "Speed Vega." 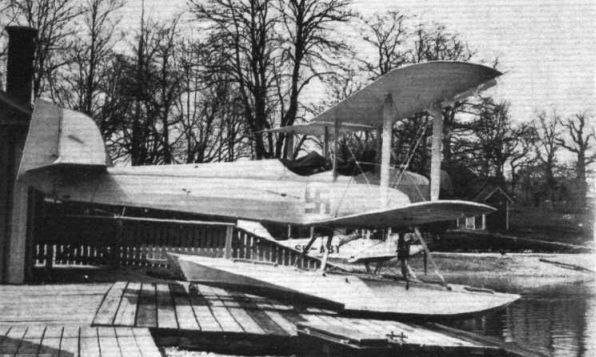 A FINNISH MILITARY TWO-SEATER SEAPLANE: This machine is built by the Finnish Government Aircraft Works, and is fitted with a Bristol "Jupiter IV" engine. View showing the undercarriage operation of the "Orion"
DORNIER'S CONTRIBUTION: A "Wal" at one of the slipways in Lindarangsviken. MILITARY FRANCE: Three C.A.M.S. 55 flying boats at moorings in Lindarangsviken. CAPT. AHRENBERG: Our illustration shows Capt. 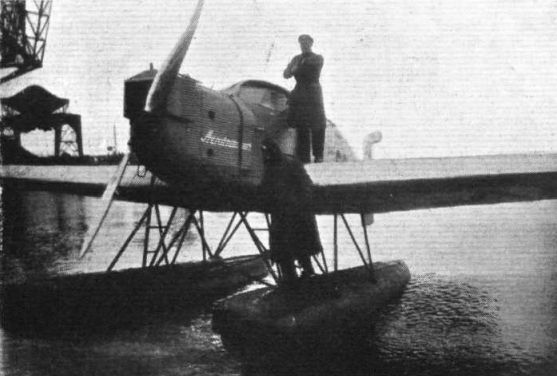 J .Ahrenberg (on float) and his wireless operator, Ljunglund, just before setting out from Malmo for Greenland in the Junkers seaplane to take part in the rescue of Mr. Courtauld. Shell spirit and oil were used for this flight, which rendered material assistance in the rescue work. 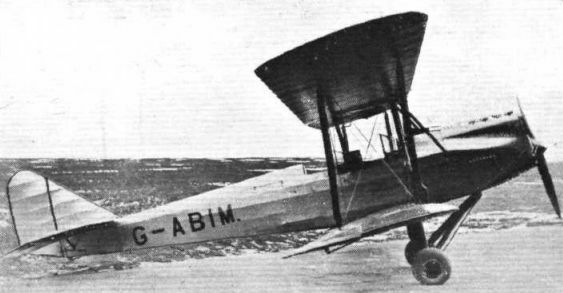 A WELL-KNOWN PRIVATE OWNER: Sir Philip Sassoon's new Puss Moth (G-ABIJ). THE PRINCE FLIES TO MANCHESTER: On May 9 the Prince flew in his "Puss Moth" from Hendon to Birmingham, and thence, on May 12, to Manchester. Our picture shows the Lord Mayor of Manchester (centre), presenting Aldermen to H.R.H. the Prince of Wales. 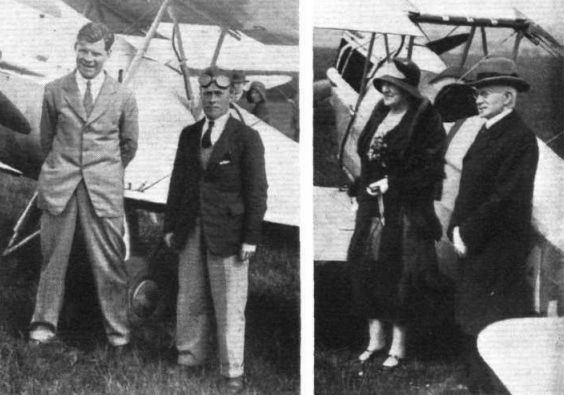 On left is Lord Derby, who received the Prince on his arrival at Barton Airport. The new Lockheed "Altaire" with retracted undercarriage. 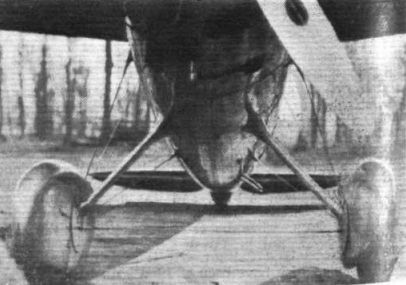 View showing the undercarriage operation of the "Altaire"
THE NEW SHELL-MEX AVIAN (GIPSY II): This aircraft has recently been added to the Shell fleet, as we announced in FLIGHT for February 20, and is fitted with Dunlop Semi-Balloon Aero Wheels. With the split axle undercarriage and the sports tyre fuselage top faring it should be an exceptionally pleasant machine. "MAN" HANDLING: A lady pupil of the Lasco Flying School, Melbourne, getting out a Bluebird (Genet Major). The "Virginia" and engines before the start. 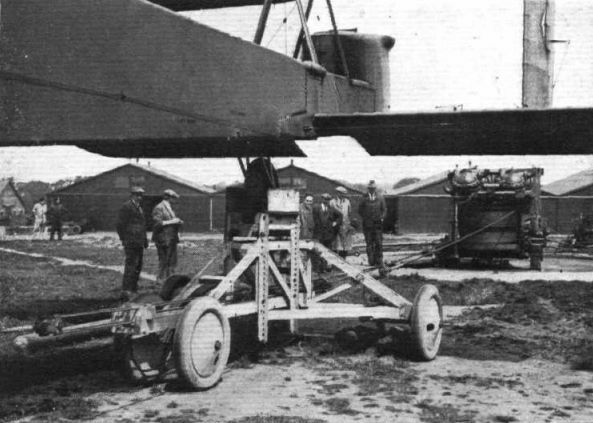 The wheeled trolley on which the tail of the machine is supported in flying position. 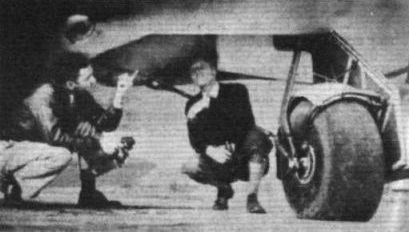 This photograph shows the point at which the cable is attached by a hook to the fuselage. THE FIRST AIR MAIL TO AUSTRALIA: The ill-fated DH "Hercules" City of Cairo, of Imperial Airways, with the mail for Australia, refuelling at Batavia. The machine, it will be remembered, crashed at Kupang shortly after. 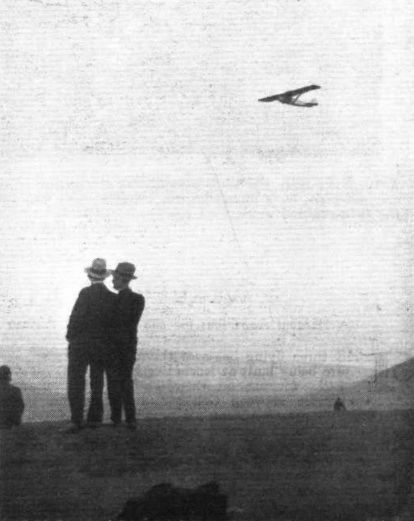 SIDE VIEW OF THE METAL "MARTLET": In spite of the fact that the machine is a vertical biplane, the view is very good. The machine doing a "zoom." "FORMARTING": Three of the S.A.C. "Martlets" put up some excellent formation flying at Shoreham on Saturday last, as shown on the picture. The leading machine is the metal job, with Mr. Miles up, and on the left of the picture is the "Genet-Major" model, piloted by F/O. Leech, and on the right the "Genet II" model, piloted by F/O. Thorn. AT SHOREHAM: On the left we show old and new Shoreham, in Mr. C. L. Pashley (right) - who was associated with this aerodrome in the very early days of flying and must now be not very far short of the 10,000-hours flying mark - and Mr. F. G. Miles, Managing Director of Southern Aircraft, a more recent "settler" at Shoreham. On the right we show the Mayor and Mayoress of Worthing standing beside the Metal "Martlet." 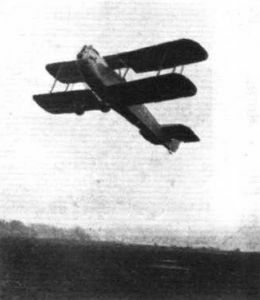 ONE TYPE IN THE TOUR OF FRANCE: The Farman 190 (230 h.p. Titan), of which two were entered. FARMAN IN THE TOUR OF FRANCE: The type 230, a machine fitted with a 40 h.p. Salmson. 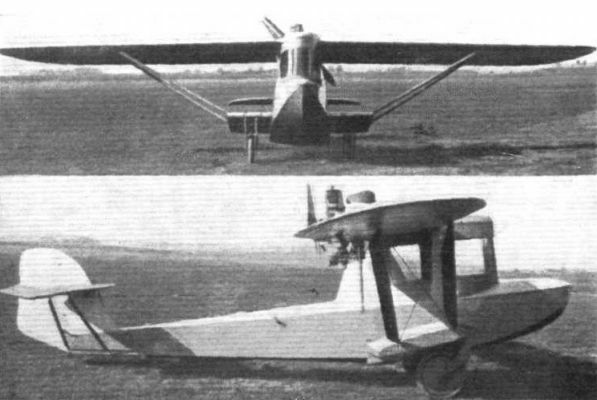 ONE TYPE IN THE TOUR OF FRANCE: The Schreck Amphibian 290 biplane flying boat (180 h.p. Hispano). 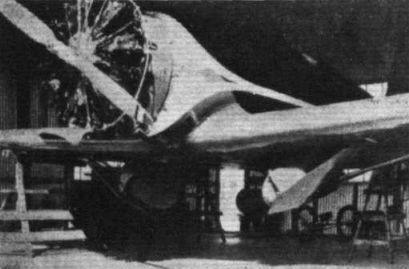 THE HEINKEL H.E.57: In this three-quarter front view may be noticed the combined tail skid and water rudder. The airscrew tips pass very close to the windscreen and probably cause considerable buffeting. THE ONLY AMPHIBIAN: Front view of the Heinkel H.E.57 six-seater. A CLOSE-UP OF THE HEINKEL: The engine is a Pratt & Whitney "Wasp." Note the hatch which gives access to the cabin. Some of ths Potez 36 monoplanes lined up after arriving at Orly on May 10. 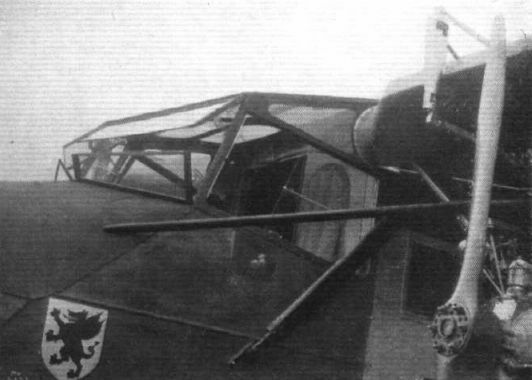 One of the twelve Potez 36 cabin monoplanes (95 h.p. Renault or Salmson) entered. This side view of Capt. Hawks in the Travel Air "Texaco 13" shows how, by means of his adjustable seat, he is able to raise himself and, having pushed the top part of the windscreen forward, thus obtain a good view when approaching an aerodrome. 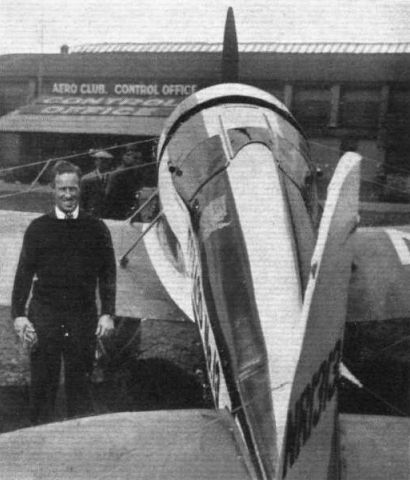 The Travel Air "Texaco 13" monoplane of Capt. Hawks created much interest at the Orly Meeting. Gen. Bares, Chief of Air Service (left), and Gen. Poli-Marchetti (right) are here seen discussing the machine. COMFORT IN THE AIR: The cabin of the latest Short "Kents" sets a new high-water mark in comfort. 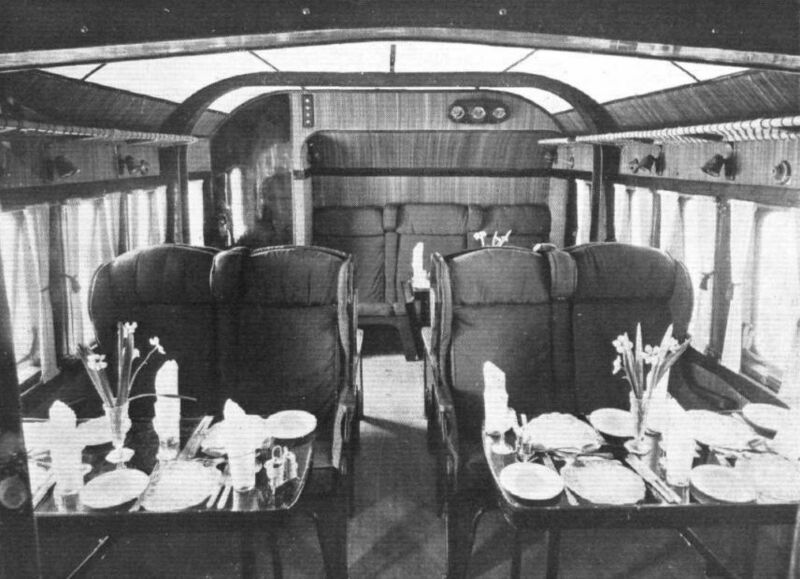 The chairs are large and comfortable, and there is plenty of leg and elbow room, as well as head room. Noise has also been reduced very considerably, so that, altogether, passengers should be able to make the Mediterranean crossing without fatigue. THE VICKERS SINGLE-ENGINED "VIASTRA": This machine has now been produced, according to the original plan, as a three-engined, twin-engined, and single-engined monoplane. West Australian Airways are using the twin-engined version on the Perth-Adelaide route. 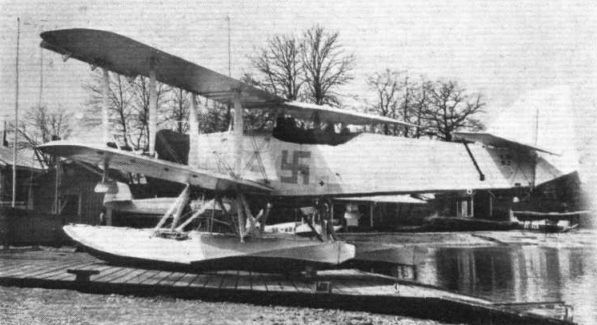 The single-engined type here shown landing at Brooklands is fitted with a Bristol "Jupiter" Series XI F.
ANOTHER HEINKEL AT STOCKHOLM: This twin float cabin seaplane is of more typical Heinkel appearance than the amphibian illustrated on previous pages. The Morane Saulnier Moth (85 h.p. Gipsy), of which there were five. READY TO START: Some of the Morane Saulnier Moths (85 h.p. Gipsy) line up for the start of the Tour of France at Orly. THREE STAGES IN THE TAKE-OFF OF THE SUPERMARINE AIR YACHT: The the boat is on its step. Clean running characterises all three stages. 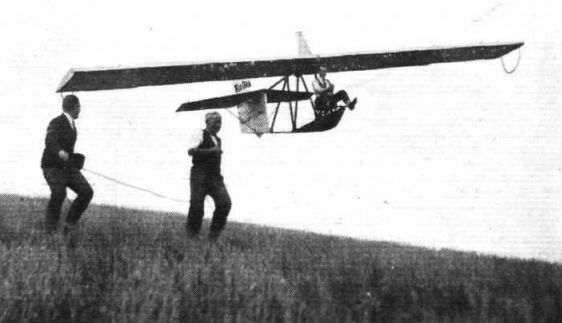 A London Gliding Club Prufling soaring over the Club's ground at Totternhoe near Dunstable. Such scenery as this is the common lot of the gliding enthusiast, as the sport takes him to the hills and not the flat uninteresting plains. THE FIZIR "A.F.2": These two views show most of the main features of the machine. The cabin top is detachable. THE "CANADIAN CUB": A single-seater light 'plane designed and constructed in Canada, and fitted with a 40 h.p. A.B.C. "Scorpion II." The winner of the Speed Contest of the Tour of France. 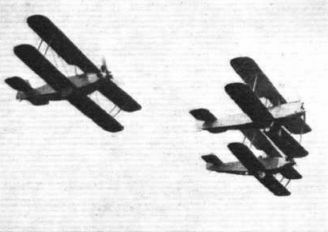 The Guerchais type 12 (95 h.p. 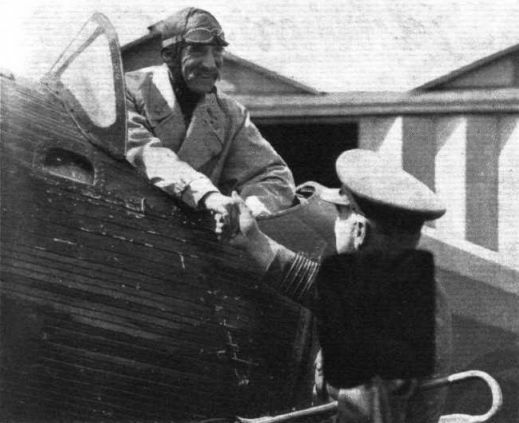 Renault) monoplane and its pilot Henry Massot. INTENDED FOR TRAINING: This Finnish seaplane, which has a Siemens engine of 120 h.p., has wooden floats of very excellent workmanship. A POLISH AMPHIBIAN: The Pulawski "P.Z.L." 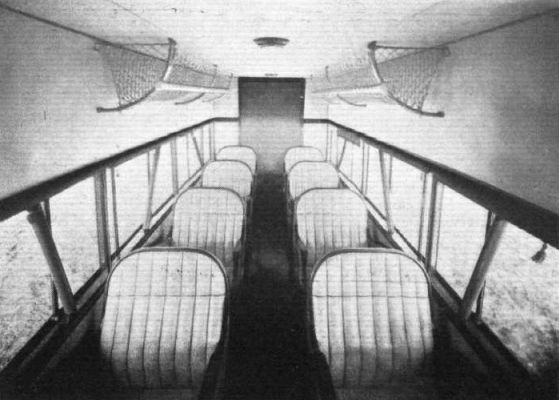 amphibian flying boat, manufactured by Panstwowe Zaklady Lotnieze, in Poland. 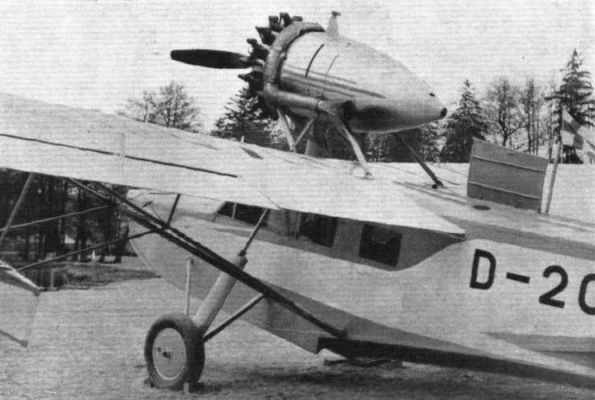 It is fitted with a D.H. "Gipsy III" engine, installed as a pusher. As such the engine has proved perfectly satisfactory, and the machine performs remarkably well.